Each year, the number of serious accidents with devastating consequences for the environment continues to grow. Legal issues arising from such incidents highlight the impact of environmental damage not only on people and places, but on the interests of those held responsible. Moreover, it is now a truism to assert that pollution does not respect national frontiers – a perspective that greatly complicates matters of standing and jurisdiction. In this context the law of tort, whether it occurs through case law developments or legislative intervention, comes to the fore. In the decade since the appearance of the first edition of this seminal work, the author has discerned indications that the debate on the role of tort in environmental law has moved on from the pros and cons of specific proposals to a more systemic approach. As litigants continue to test tort-based principles, some in hitherto uncharted waters such as climate change, the prospect of establishing tort as a component in a system of environmental protection has come to the fore. implications of especially significant cases such as Deepwater Horizon, Niger Delta litigation, and Fukushima. Through a detailed analysis of the fundamental nature of tort and the wider arguments concern-ing its proper function in modern society, this book offers compelling conclusions regarding how tort can play a part in developing a public trust doctrine in environmental law. No one with an interest in the development of environmental law can afford to ignore it. Chapter 1. The Law of Tort and the Environment: An Introduction to the Debate and Foundational Issues. Part II. Traditional Tort-based Remedies and Environmental Protection: A Common Law Perspective. Chapter 2. Conventional Tort-based Approaches to Environmental Harm. Chapter 3. 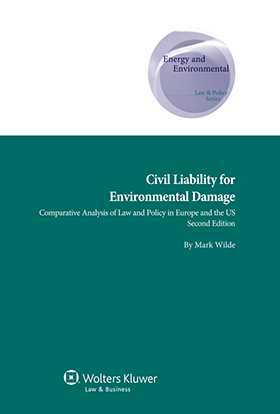 Establishing Liability for Environmental Damage: Main Issues. Part III. The Role of Tort as a Means of Environmental Protection: Theoretical Perspectives and Legislative Initiatives. Chapter 4. The Role of Tort in an Environmental Context. Chapter 5. The European and International Dimension. Part IV. Increasing the Role of Tort as a Means of Environmental Protection: A Comparative Analysis of Substantive Rules in Certain EU States and their Common Law Counterparts. Chapter 7. Reducing the Burden of Proof on Causation. Chapter 8. Access to Justice I: Liberal Conferral of Standing. Chapter 9. Access to Justice II: Class or Group Actions. Chapter 10. Remedies for Environmental Damage. Chapter 11. Financial Provision for Extended Civil Liability. Chapter 12. Conclusion: The Nature of Tort-based Liability in an Environmental Context.